India and Sri Lanka agreed on Wednesday to free all fishermen and release their vessels under their respective custody “immediately”, Sri Lankan Minister of Fisheries and Aquatic Resources Rajitha Senaratne said. The process of releasing the fishermen and vessels will start on Thursday, he said, adding he would be directing his ministry and the Attorney General’s department in this regard. 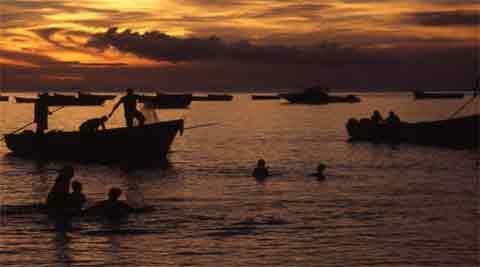 “About 160 Sri Lankan fishermen and four vessels are to be released from India. On the part of Sri Lanka, 236 (Indian) fishermen and 90 boats are to be released,” he said, after meeting Union Minister for Agriculture Sharad Pawar here. He said a meeting between the fishermen of Sri Lanka and Tamil Nadu would held as per the request of Indian government. Asked about the key issues likely to figure in the meeting, Senaratne said his country would raise the issue of bottom trawling by Indian fishermen. “About 1,200 boats are entering into Sri Lankan waters every day and doing bottom trawling, which is banned in Sri Lanka,” he added. The Sri Lankan Fisheries Minister alleged 45,800 boats from India have entered Sri Lankan waters for bottom trawling, which, according to him was a very bad method of fishing. Bottom trawling relates to casting of fishing net so deep in the sea that when the net is picked up, it tends to bring with it besides fish other forms of marine life. He denied the charge that the Sri Lankan Navy was attacking Indian fishermen. “Your (Indian) own navy commander, your own Director General of Coast Guard have informed the court that it was not so,” he told reporters. Moreover, a six-member committee, comprising three Indian and Sri Lankan officials, has been constituted to resolve the problems relating to fishing between the two countries. While the Indian team would be headed by the Agriculture Secretary, the Sri Lankan side would be led by the Director General of Fisheries. Senaratne also met the External Minister Salman Khurshid.